"I'm glad that we can have that impact, but you don't expect it,' he said. "But it's cool because we represent a lot of people, couples that are going through the same thing and so it's just an honor to be able to represent that,' said Kelly. Six years after he joined the Marine Corps in 2003, Jesse Cottle was dismantling an explosive device during a deployment when it went off, leaving him a double amputee. 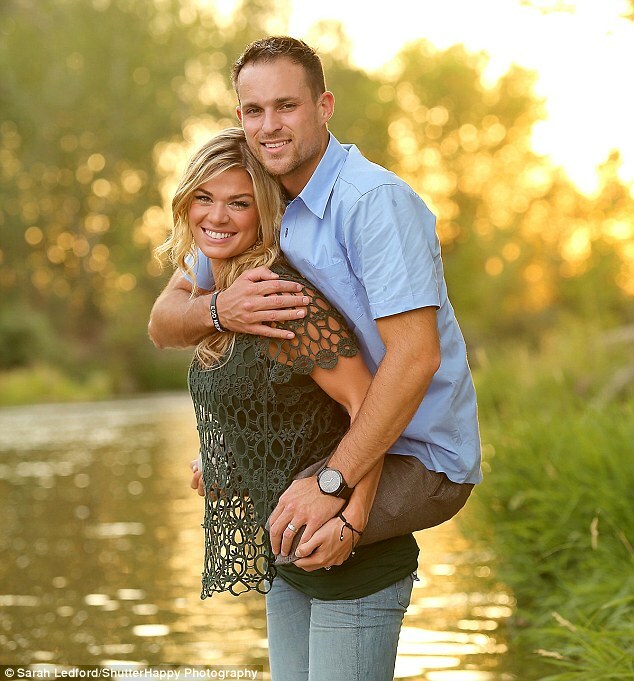 But despite his debilitating injuries, he met his beautiful wife Kelly, a swimmer for Boise State, during a competitive meet in San Diego soon after he arrived home, and the pair married a year ago. The touching photograph of the couple was taken recently while they visited her family in Idaho. Maybe I can relate with this couple and what they stand for because my husband underwent a surgery which left him having to use a walking stick, it made no difference to me. I only realized how shallow people could be when I was walking down the road with him one day (I was wearing a skirt) then a guy slows down next to me and says "You have such perfect legs and he has a broken leg. What a combination." Such courage and a great story. I love their smiles.